This scarf lets you wrap yourself in a piece of space-exploration history with the very first color image taken of Earth from space. It is part of a series of scarves made using freely available NASA photos. Want to wrap yourself in the cosmos? Now you can: The newest collection of limited-edition silk scarves, printed with vivid NASA photos, from the New York City-based boutique Slow Factory has just been released. 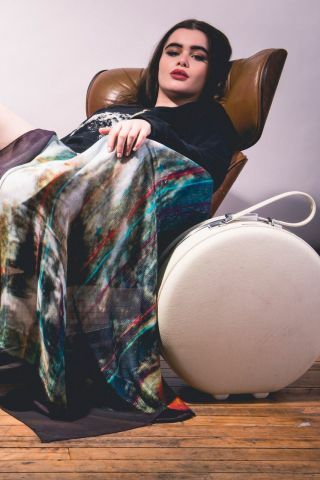 Céline Semaan Vernon, founder and CEO of the boutique, has been creating the scarves for four years now, using images she takes from NASA's creative commons. Although Vernon's earlier scarves added a little mystery to wearers' wardrobes, with the swirling colors of nebulae or an image of exposed Martian rock, Vernon's new line focuses on a more personal part of the cosmos — the planet humanity calls home. Vernon named the new line "We Are Home" and chose images that represent Earth and the history of space exploration. But not just any old image of Earth made the cut. In order to be included on the new scarves, the pictures had to be "awe-inspiring," Vernon told Space.com. This scarf, made by Slow Factory, calls viewers to relive the excitement of the Apollo 11 liftoff with a photo of amazed faces watching the craft launch. One scarf shows a sea of faces in an old black-and-white photo, all staring up in wonder at the Apollo 11 liftoff. "It is just heart-warming and spectacular to watch these people look up in amazement," Vernon said. Other scarves depict the first-ever color photo taken of Earth from space, which Vernon calls "First Earth Selfie," and a group of spacecraft ready for liftoff. The line also features scarves printed with close-up images of Earth, including shots of clouds over the sea and rainbows. By turning beautiful images of the Earth into scarves, Vernon said she hopes "to raise awareness about the fact that we are all in this together, floating in space on mother-ship Earth." That idea — that all people share the same home — connects to Vernon's deeper project: to support refugees in Lebanon. Part of the proceeds from the We Are Home collection go to ANERA, a nonprofit that aids refugees in Syria and Lebanon. The cause is close to Vernon's heart, as she is a Lebanese expat who had to flee Beirut in the midst of a war in the '80s, seeking refugee status in Canada, she said. "Having to leave everything behind and start over again is something I have seen my father do over and over again, until we were safe and had a place to call home," she said. "We Are Home, our collection, is a symbolic collection made to honor those who had to leave." This Slow Factory scarf, bearing a picture of the Earth emblazoned with the words "we are home," suggests that everyone on Earth has at least one thing in common. In addition to the celestial scarves, the new collection includes a key necklace modeled after the key to Vernon's home in Beirut. "That key is made to honor the refugee tradition to wear their home key around their neck," she said. She will be donating 10 percent of the proceeds from those keys and the rest of the collection to ANERA to offer job-skill training to Syrian refugees, Vernon said. The collection is in full stock on Slow Factory's website, http://slowfactory.com, after the line's official launch on April 22, which happens to be Earth Day — the perfect release date for a collection that's all about the Earth. Editor's Note: This article was updated to clarify that ANERA helps Syrian refugees in particular.